Crunchy moms are always looking for cleaning products that really work, without exposing the family to toxic fumes or unduly harming the environment. Vinegar has to be the number one recommended “natural” cleaner, and it does work for a lot of applications, particularly cleaning glass. There are indications that vinegar disinfects, but as this article points out, the claims for vinegar’s disinfection properties are often vague, and purported demonstrations of its effectiveness in isolated tests just doesn’t give me that warm fuzzy feeling that official documentation does. Well, Shaklee claims to offer the best of both worlds – their Basic G disinfectant has those reassuring government tests demonstrating it’s effective against 40 different microbes, while they say it’s better for the environment and safer for the user than the mainstream alternatives. Basic G lists didecyl dimethyl ammonium chloride and n-Alkyl (C14-50%, C12-40%, C16-10%) dimethyl benzyl ammonium chloride as its active ingredients. Shaklee’s information is full of happy-sounding but somewhat imprecise descriptors like “no fumes,” “safe,” and “environmentally friendly.” I have to say I’m rather frustrated as I try to figure out whether this stuff is really much better for humans or the Earth than bleach or Lysol. Shaklee doesn’t offer any concrete evidence. Googling turns up lots of breathless reviews that take Shaklee’s claims at face value, and a couple sites that complain the ingredients are toxic. Of course, I suspect these sites are pretty quick to clutch their pearls at any “chemical,” and would object to any cleaner that isn’t safe for use as a dessert topping. Shaklee likes to note that Basic G is “EPA registered,” leaving the implication that the product is somehow certified to be environmentally friendly, but that is not what “EPA registered” means. If a disinfectant (in this situation referred to as a “pesticide”) is registered with the EPA, that means it has been tested and confirmed to kill certain microbes effectively, and the EPA has determined certain standards for its use. That is certainly useful information, and one reason I like Basic G is that there’s official confirmation that it works, but I think many customers are going to assume the EPA registration means it’s “green,” and that’s not the case at all. I can tell you that the Basic G concentrate bottle and the bottle it’s meant to be diluted in both carry the standard warnings against drinking, inhalation, eye contact, and prolonged contact with skin. Some Shaklee distributors’ sites say the diluted product is so safe you could drink it, but obviously that’s not recommended, and the fact that the warnings come on the dilution bottle as well make me really doubt it’s that safe and gentle. (It’s also worth noting that bleach, while it is toxic and can be dangerous, really can be drunk when properly diluted.) After all, this fluid is meant to kill living organisms with minimal contact time. Anything that can do that is going to be potentially toxic. So, let’s assume that this is an effective cleaner that is relatively safe if handled properly, but which isn’t as benign as soap and water or vinegar. What’s it like to use this stuff? Well, Shaklee doesn’t make it very easy to use. They offer a spray bottle specifically meant to hold the diluted product. However, the instructions on the concentrate tell you how to make 1-2 gallons of cleaner, while the sprayer holds 16 ounces. To use the right amount of concentrate for the sprayer, you need to do some fractions, then measure out 3/8ths of a teaspoon of Basic G for each 16 oz of water. Unfortunately, the sprayer isn’t worth all this trouble, as it has two settings: “OFF” and a high psi stream that tends to rebound at you when you shoot it at any surface. Now I know why the warnings suggest safety goggles! I hied over to my grocery store and bought a 32 oz sprayer (takes 3/4 tsp of concentrate) with a fully adjustable nozzle that lets me set it somewhere between a spray and a mist, like I like it. 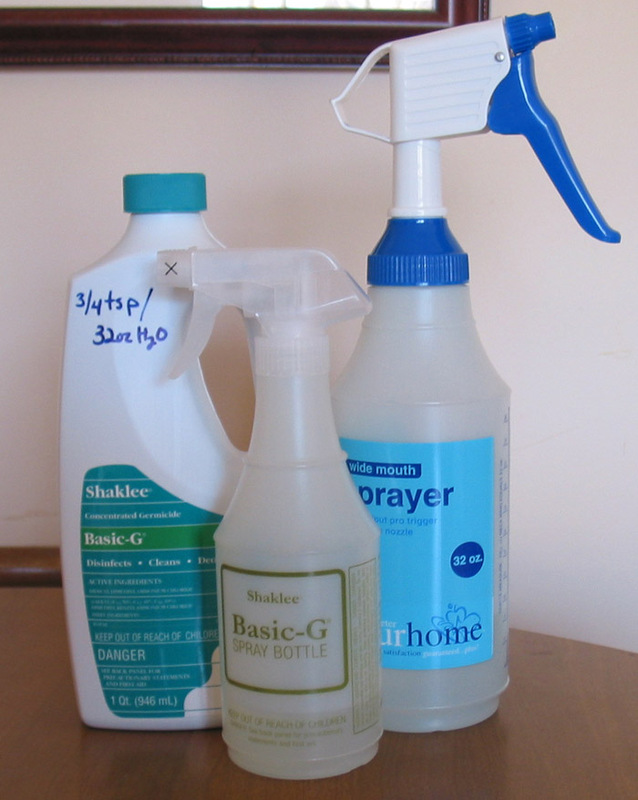 Now that I bought a decent sprayer and wrote the correct formula on the concentrate bottle, I’m pretty happy using Basic G. I use it in the same way I used to use bleach solution – I spray down my sink at the end of cleaning, to make sure any foodborne germs are killed, and I spray counters that may have contacted raw meat or eggs. For disinfection of cutting boards, dishes, and utensils I just use hot soapy water or the dishwasher. To avoid anything nasty growing in my cleaning implements, I use dish cloths that I wash in the laundry on hot, and brushes that I chuck in the dishwasher. I find soap and vinegar sufficient for cleaning my bathroom surfaces, as I don’t prepare food on them! So my use of germicidal solution, whether it’s bleach or Basic G, is pretty limited, and I’m not too worried about having undue impact on our health or environment. So, bleach or Basic G? I don’t see good reason to assume Basic G really is greener than bleach, and I use relatively little germicide so any impact is minimal. For Basic G, one $20 bottle of concentrate will fill my spray bottle 256 times. Several Shaklee consultant sites mention that once mixed it will last for 30 days. To obtain it I need to locate a Shaklee rep or buy it online and pay shipping. With bleach, I need 1 teaspoon per 32 ounces of water, and I can buy 576 teaspoons of bleach for about $2. However, bleach solution needs to be made fresh daily, which is a pain. And yet, it’s much easier to buy some bleach during my regular grocery run than it is to procure a bottle of Basic G. I think they’re about neck-and-neck. But it looks like my current bottle of Basic G will last for a few years, so I have time to think about it. Personally, for home disinfection, this makes me feel comfortable using bleach solution for a month or more, since I store it in a closed opaque bottle, and I’m not trying to disinfect an avian flu site or protect a cystic fibrosis patient. I clean up, and the bleach is a little safety net. If my 1:100 solution winds up being more like .5:100 by the end of the month, I don’t think I’m going to worry about it. Thanks Grace, for bringing this up! Just adding a note – if you wish to offer some facts, or even opinions about how great Basic G is, have at it. But if you include any marketing materials, including any link to your personal Shaklee sales page, I’m just going to mark it as spam. So don’t bother trying to drum up business with comments.